A holiday in Berlin is for the sophisticated fun-lover and culture vultures. Its famous cabarets and nightclubs are in full swing, and its opera and concert venues seldom miss a note. 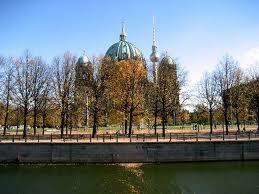 It is also a city of museums and memorials, grist to the mill of those who travel to Berlin for sightseeing. Since the reunification of Germany in 1990, Germany’s capital Berlin has become one of the most popular tourist destinations in Europe. With impressive cultural attractions as well as being Germany’s capital of fashion, style and music, the dynamic city of Berlin is once again thriving. Berlin’s main international airport is called Tegel Airport. One of Europe’s main airports, Berlin Tegel is served by international airlines from all over the world. There is a good choice of direct flights to Berlin, Germany from the UK with scheduled flights operated by British Airways, Lufthansa and BMI. Low cost flights to Berlin, Germany are also available from the UK on Ryanair and easyJet. With a bloody and brutal history and severe damage caused by heavy bombing during World War II, vast swathes of the city were rebuilt and over the last sixth years it has been restored to its former glory. Many of Berlin’s famous attractions are steeped in power and history, one of the most popular and well-known attractions is the Reichstag which is now home to the German Parliament, the Bundestag. Don’t miss the Brandenburg Gate, which previously divided West and East Berlin and is now the symbol of reunified Berlin and Checkpoint Charlie, the famous Berlin Wall checkpoint built by US forces in 1961. Head to Berlin’s Unesco listed Museum Island which boasts 5 world-class museums housed in some of the most beautiful buildings in Berlin. Displaying superb collections of works of art, sculptures and ancient antiquities, choose from the Old National Gallery, the Old Museum, the Bode Museum, the Neues Museum and the Pergamon Museum. 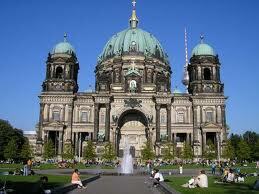 Also on Museum Island are the Dom Cathedral and the Stadtschloss, a magnificent and huge 19th Century palace. If you fancy a day away from Berlin’s many cultural attractions, the Berlin Zoo is well worth a visit. One of the largest zoos in the world with over 15,000 animals, Berlin Zoo opened more than 150 years ago and is home to a wide range of animals including elephants, gorillas and rhinos. For a spot of retail therapy, head to Berlin’s popular Kurfurstendamm, known as Ku’damm, famous for its shops, restaurants and bars. For cheap flights to Berlin, Germany, it is generally advisable to book in advance or to book out of season avoiding busy holiday periods particularly during the summer and at Christmas. Most of the airlines run special offers on flights at various times during the year, take a look at German airline Air Berlin for some of the best deals on cheapest flights to Berlin, Germany. At Directflights.com, we are committed to finding you the best offers on flights whether you are looking to book your trip in advance or searching for lastminute flights to Berlin, Germany. Summer weather in Berlin is pleasant and sunny, when days are long and temperatures can sometimes exceed 86F (30C), particularly in July and August. However the summer months are also unpredictable, and odd days can rapidly change from sunshine to cloud. Winter weather in Berlin, by contrast, is bitterly cold and damp, with plentiful snow and frosty days when temperatures hover at or just below freezing. Rain can fall all year round, but the wettest months are June and August, and the driest on average October and February.